November 11 is Veterans Day, a time to pause and honor the 21.8 million people who have served in the U.S. armed forces. The team at Tiller Money has several strong military connections. We are grateful for all who have served. The discipline forged in military life can translate into a powerful work ethic and entrepreneurial mindset. Military service has provided a foundation for economic success for millions of veterans in the U.S. Indeed, veterans play an integral role in the economy, accounting for 9.1% of U.S. business ownership. However, Veterans Day is also an opportunity to reflect on the unique economic challenges faced by military families. Not Enough Program Participation – For example, only about 40% of service members participate in the Thrift Savings Plan. Inconsistent Spousal Income – Constant relocation can wreak havoc on the ability of military spouses to find stable work and to pursue their own goals. Military compensation is often “lumpy” rather than regularly scheduled. This leads to uneven cash flow, with little money on hand when bills are due. As a result, active service and veteran families borrow at higher rates than civilians. 58% of veterans carry debt from month to month, almost twice the rate of civilians. 30% of veterans have gone over their credit limit, bounced or forged a check, been reported to a collection agency, or fallen victim to a financial scam. 6% of service members versus 3% of civilians have paid less than the minimum required payment to service their debt in the last 12 months. As noted above, predatory payday loans are one of the biggest financial traps for military families. The military requires payment by direct deposit to a bank account, so almost no military personnel are unbanked. However, a study by Moneythink finds that many military families are categorized as underbanked, with poor access to mainstream financial services. Indeed, 35% of military servicemen use some form of non-bank borrowing. The same survey found that translating military experience into civilian job skills is a consistent challenge. 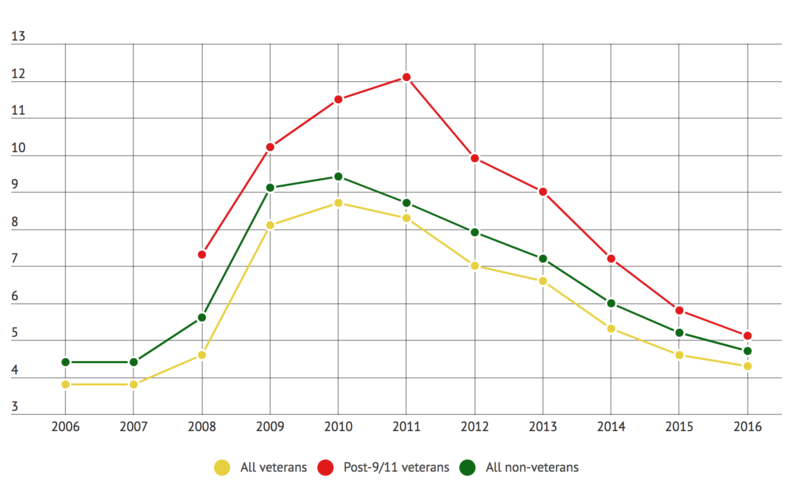 The unemployment rate for post-9/11 veterans has dropped from 12.1% in 2011 to 5.1% in 2016. However, the MilitaryTimes.com reports that many veterans say they are underemployed. Some big companies are making moves to hire vets. For example, Wal-Mart has pledged to hire 100,000 veterans by 2018. Starbucks’ is running a campaign to hire 10,000 veterans and military spouses by 2018. The good news is that the unemployment rate for veterans is almost on par with that of civilians; traditionally it has been much higher. Even after experiencing the struggles of returning to civilian life, 89% of veterans who served in Iraq and Afghanistan since 2001 said they made the right choice in joining the military, according to research from the Kaiser Family Foundation. Perhaps one of the best ways America can honor our veterans is by making sure they have training, resources, and a more consistent payment schedule that supports them long after they’ve left active duty. Preparedness – and gratitude for service – takes many forms.